uery Builder is one of the very few native administrative tools available for Business Objects XI and BI, yet it continues to remain in obscurity for most administrators and developers because of the lack of documentation and training offered for Query Builder. My name is Julian Romeo and I know what it is like to struggle with Query Builder. I have been there. I have thrown my hands up when CMC failed on me and I was left with nothing but hope that it would come back without a complete restart. I have also witnessed public and private reports spontaneously and unexplainably throw errors and even become completely unusable. During those hopeless moments I wished someone had told me how QueryBuilder could help as I want to tell you. I have worked intimately with the Business Objects reporting platform for the past 9 years. For the last 7 years I have struggled in my quest to realize BO Query Builder’s true potential. Because I’ve found my struggles so frustrating and my learned insights of Business Objects Query Builder so valuable, I decided that I should find a way to share my acquired knowledge with others and prevent them from facing the same frustrations. Why Should You Use BO Query Builder? Engineers and consultants working for SAP Business Objects use Query Builder quite often. It can provide the most pure, accurate, and rapid information about your BO repository; more so than any other BusinessObjects tool. BO Query Builder should not be ignored or overlooked by administrators and technically-oriented developers. On the surface Query Builder is a simple GUI tool which enables the user to run queries against the Business Objects repository (also known as the CMS InfoStore). Nevertheless, upon deeper analysis one will discover that Query Builder has the ability to provide invaluable insights beyond those available through InfoView, BI Launchpad, and the Central Management Console (CMC). In fact, Query Builder allows a knowledgeable user (such as one that studies our guide) to peer into the mysterious under-workings of the BOXI repository object meta data. How Will the Business Objects Query Builder Guide Benefit You? Students of the guide will be introduced into the real strength of Query Builder, running custom Query Builder SQL statements. No prior knowledge of SQL is required, but expect to step away from the guide with definite SQL knowledge. Syntax, tables, operators, and functions (yes there are some) will be discussed in detail. The Business Objects Query Builder guide will specify the best methods of utilizing BO Query Builder and help you to tune your more sluggish queries to the highest level of performance. Sample queries will be provided to get you started immediately and provide inspiration for your own custom creations that will meet your requirements. Applicable to Business Objects versions XI R2, XI 3.0, XI 3.1, and BI 4.0! Query Builder is based on the BOE SDK. Both Query Builder and the SDK in their BO XI 3.1 and BI 4.0 versions support all of the older methods and syntax used in BO XI R2. In fact, syntax that was labeled as deprecated in XI R2 continues to function even in XI 3.1 and BI 4.0. It is certain that XI 3.x brought some new functionalities, and this guide will distinguish these, but rest assured most of what you can do in Query Builder is applicable to all BO XI and BO BI releases. Including powerful Relationship Queries which are covered thoroughly in the guide! Our guide is written specifically to make anyone proficient in utilizing Query Builder. It walks the beginner through the ins and outs of using the GUI to “build queries” and then guides and encourages them to take the next logical step into generating their own custom Query Builder queries. 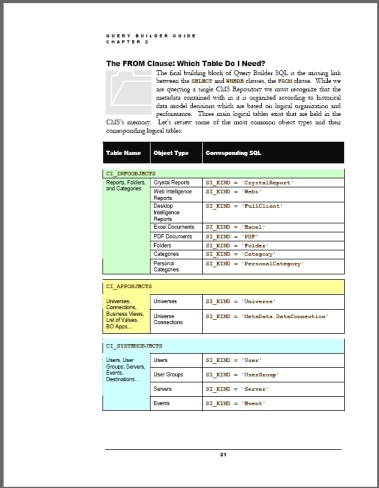 The guide completely removes the mystery and confusion surrounding the different logical tables needed to retrieve every kind of object. Our guide details the limits of BO Query Builder and its divergences from standard SQL, from operators to data types. In doing so, students of the guide learn how to quickly build syntactically correct BusinessObjects Query Builder queries from scratch. The “Business Objects Query Builder Guide” uncovers little known functions and syntax that open up new possibilities for BusinessObjects Administrators. This knowledge can lead to new Query Builder outputs that can drastically impact daily operations of the platform and strategic administrative decisions. The guide will show its readers how Query Builder can quickly detect problems in the binding between reports and universes. Detailing how to optimize Query Builder queries is just another of the many valuable lessons contained in the “Business Objects Query Builder Guide”. Readers will discover the little-known facts regarding which properties are indexed. With this knowledge they may be able make run-away queries execute in seconds. The guide will also educate its students on the importance of selection criteria order on query performance. With this knowledge deeper and more valuable querying possibilities will be at your fingertips, literally. “Over the past 6 months we’ve developed a BO Metadata Repository that uses Query Builder and the SDK to extract the metadata. We are now able to create Webi reports against this new Repository to easily list out our reports, universes, users, groups, their relationships to each other, etc. We also created a Webi report that will compare multiple universes and identify the differences. Customers of the Business Objects Query Builder Guide will receive access to the guide in Portable Document Format format (PDF); however, more importantly they will be granted free access to any future versions of the guide. Now that's future-proof!!! How Can You Obtain "The Most Complete Business Objects Query Builder Guide Ever Written"? We have called upon countless hours of real-life Query Builder experience and many more hours in verification research and documenting efforts in order to produce this comprehensive Business Objects XI Query Builder Guide. We are confident that beginners and veterans alike will find it insightful and quite helpful, especially for the reasonable price of $27.00 USD. In fact, we are confident that students of the guide who leverage its teachings will find that it pays for itself in two weeks, or even much less, in the form of increased efficiency, capability, and new-found knowledge of your BO system. 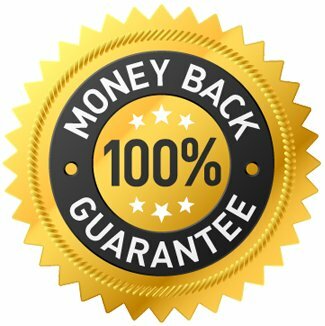 Of course, we do provide a 100% Money Back Guarantee to the very unlikely customer who might not find this to be the case. 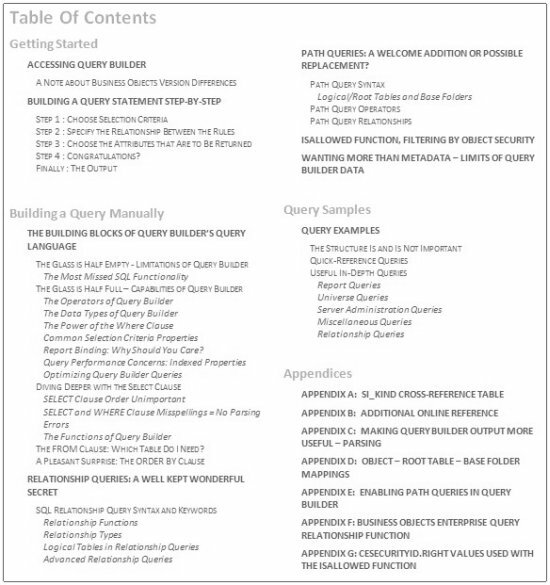 "The Query Builder's Guide is a fantastic resource, and well worth the price just in terms of time saved and insight gained. In addition to being the help file that should have been included originally, it is also full of very useful pre-built queries that give an excellent overview of the capabilities of the tool. I have incorporated a couple of these queries directly into my daily gathering of metrics on the system." 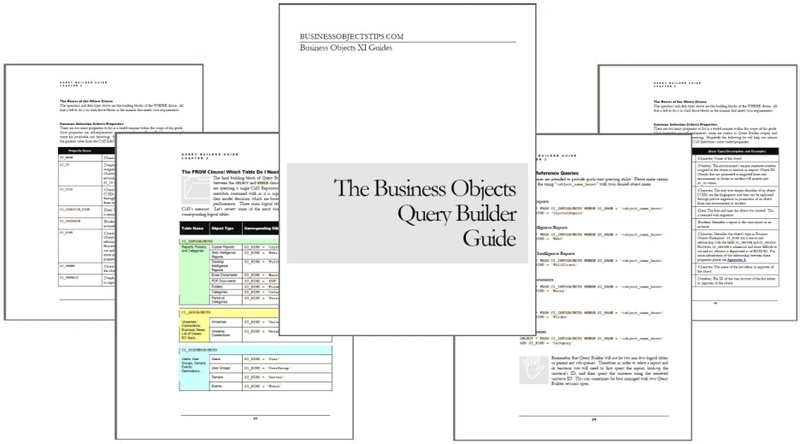 "The Business Objects Query Builder Guide"